Toe-tally! : Cameron had foot surgery to remove a bone spur from his toe on March 26th. It put him on the couch and on crutches for his spring break, but it was causing him a lot of pain, and once the surgery has healed he'll be good as new. A new dawg: After waiting nervously for what seemed like forever, Cameron finally received an acceptance letter from the University of Washington. It's the only place he wanted to apply for college, where he hopes to major in mechanical engineering, and he is very excited. (Amy is excited, too, not only because the UW is her second home but because, even though Cameron will not be living at home, he won't be too far away!) Go, Dawgs! 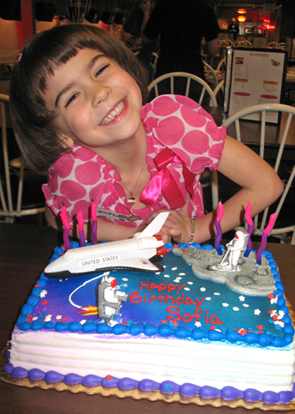 Six is sweet: Sofia turned six at the end of January. She had a special birthday celebration at the Montessori, after which she shared chocolate chip cookies with her classmates. For dinner at home that night she'd requested chicken nuggets, accompanied by French fries and frozen peas. Cameron and Brennan helped her open gifts, and she blew out candles on a chocolate mousse cake. A week later she had a party for her friends at TechCity Bowl in Kirkland. She chose Space for her birthday theme. ("Space is cool, Mom. It's always moving. It's like we're on a ride.") The kids had a blast bowling, and Sofia was very excited to end the hour with the highest score, a 78. Next followed pizza, cake and wonderful presents. What a terrific birthday for a terrific girl! Getting away: In mid-January Amy, Jan, and Sofia (Cameron was finishing up his first semester of senior year) stole away for a week-long change of pace on a cruise to Mexico on the Royal Caribbean's Mariner of the Seas. Jan's mother and sister Monique flew from Holland to accompany us. It was a relief and treat to trade the Seattle weather blues for Mexican sun and warmth, enjoy some wonderful meals, spend time with distant family, and lose ourselves in brief exploration and adventure in Cabo San Lucas, Mazatlan, and Puerto Vallarta. Born April 24, 1932 (celebrated each May Day), passed away December 15, 2009, at Evergreen Hospice in Kirkland. She grew up in Minneapolis, graduated from the University of Minnesota, and moved to Washington in 1966. She was employed for over 20 years at the University of Washington. After retirement she worked for Seattle’s Arboretum Foundation and volunteered as a guardian ad litem. Music and theater were lifelong passions. Preceded in death by her son, Joseph O’Brien, she is survived by her daughters, Amy de Rie and Anne Lawson, and four grandchildren.